These days, people's dogs have become bona fide members of the family. Moving from the kennel to the couch, they share our beds, family rooms, and holidays; and they are recipients of our kindest and utmost concern. A pet partnership is a lifetime commitment. Do it right, and your dog will become an important and valuable part of the family for many years. Do it wrong, and you've broken a sacred covenant between humankind and another living being. Dogs For Dummies, 2nd Edition, is for you if you are looking to adopt a dog, trying to improve the relationship with the one you have, or attempting to come up with fun things to do with your canine companion. This book is also for people who want to Choose the right veterinarian Explore the dog-breeding business Find breed-rescue groups Identify canine health problems Look for a purebred It's a "doggy-dog" world, and this easy-to-use guide will help you navigate it. Improve your chances at pet success by knowing how to raise and live with your dog properly. Discover which breed best suits your lifestyle, and if a puppy or adult dog is best for you. 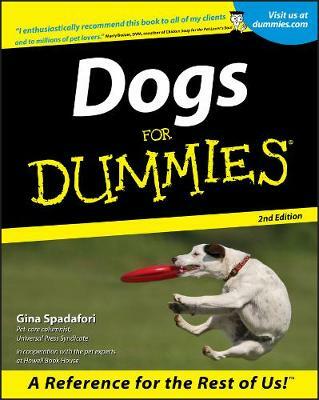 Dogs For Dummies, 2nd Edition, also covers the following topics and more: Caring for an aging dog Choosing collars, harnesses, halters, and leashes Considering euthanasia Feeding Fido the right way House training puppies and adult dogs Keeping up appearances with good grooming Participating in canine competitions Preparing your dog for a disaster Traveling with your dog Award-winning author Gina Spadafori says the lack of accurate information not the lack of effort or concern is often the reason for doomed people-pet pairings. With her help, you can avoid the agony. Dogs For Dummies, 2nd Edition, is full of useful tips, how-to advice, illustrations, and photographs (both color and black-and-white). You deserve a healthy, happy, and well-mannered canine companion; and you'll be the owner every pet wants and deserves informed, responsible, and loving.